Barbara Bry fell just 210 votes shy of winning the open District 1 San Diego City Council seat Tuesday night, but easily claimed a runoff spot against Republican opponent Ray Ellis. With all precincts reporting, Democrat Bry, a high-tech entrepreneur, had 49 percent of the 23,085 votes cast to small-businessman Ellis’ 34 percent — setting up a November rematch that could decide the council’s political balance of power. Two incumbents were headed for re-election, meanwhile, as five seats on the nine-member panel were up for grabs in this election cycle. The race for District 1 — which includes Carmel Valley, La Jolla and University City — is seen as pivotal on the technically nonpartisan panel. 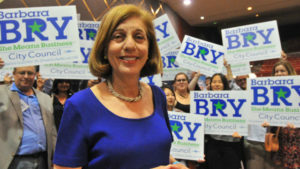 Democrats cling to a 5-4 majority, which would be maintained with a Bry victory. The winner will replace council President Sherri Lightner, being termed out after eight years. After Bry and Ellis came Lightner’s husband, Bruce, who was third with 9.5 percent, while council staffer Kyle Heiskala had 5.8 percent and Louis Rodolico had under 2 percent. 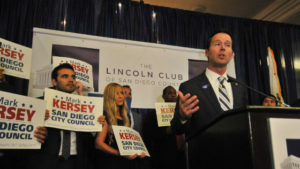 In other races, incumbents Mark Kersey and Scott Sherman were coasting to re-election. In District 5 — Rancho Bernardo, Rancho Penasquitos and Scripps Ranch — Republican Kersey gained 71 percent of the vote, well ahead of the 19.8 percent for Democrats Fotios “Frank” Tsimboukakis and 9.3 percent for Keith Mikas. Voters gave Republican Sherman 62 percent in District 7 — Linda Vista, Mission Valley and San Carlos — compared to 22 percent for Justin DeCesare and 16 percent for Jose Caballero, both Democrats. In the two other City Council races — both for open seats — one wrapped up while the other was headed for a runoff election in November. 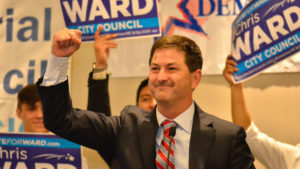 In District 3, where Councilman Todd Gloria is being termed out, fellow Democrat Chris Ward picked up 59.2 percent — comfortably above the 50 percent threshold for outright victory. Anthony Bernal collected 27 percent and 13.7 percent went to Scott Sanborn. The district covers downtown, Hillcrest and North Park. Ward, chief of staff to state Sen. Marty Block, will be the fourth consecutive gay or lesbian council member in District 3 — following Christine Kehoe, Toni Atkins and Gloria, moving up the state Assembly. In District 9, where Councilwoman Marti Emerald chose not to run for re-election, her chief of staff Ricardo Flores led with 36.1 percent, followed by Georgette Gomez with 30.2 percent, Sarah Saez with 22.4 percent and Araceli Martinez with 11.2 percent. The eventual winner will represent most of City Heights, the College Area and Southcrest. Bry, the top District 1 vote-getter, wouldn’t speculate on whether a large Democratic turnout gave her an edge.